If you are a big fan of handmade or vintage items, then you’ve probably asked – does Etsy have an affiliate program. Well, they do and it’s been around since January 2015. But, before signing up, let’s go through some basic details to help you understand the marketplace a little better and how you can make the most out of their program. Etsy is basically an international marketplace that sells thousands of unique and personalized handcrafted goods, primarily in the following categories. Most sellers are either independent creators or small business owners, specializing in their own skills and talent so the products are likely different from what you’d get on commercial or drop shipping sites. Each seller has their own profile, location and a list of items that are being offered through the marketplace. One can also communicate with the sellers through private messages for inquiries and such. Anyone can basically order the products, but shipping fees will vary according to the distance between the buyer and the seller. If both parties are located within the same region, the fee would be minimal and vice versa. These are good niches to be part of – most of them are evergreen, meaning there is always going to be plenty of product ideas and market opportunities on the internet. Plus they are generally fun to talk about too. 1 – Pick a Niche – The best way to approach this site is to select one niche that you truly like and leverage from one (or several products) from the marketplace within that given space. The requirement however, made it clear that you must own a website with substantial content that reflects quality, relevance and variety. It also means you shouldn’t just focus on promoting products from Etsy. You may talk about items from other marketplaces like Amazon Handmade (a good reason to be part of the Amazon Associate Program) or Redbubble as long as they fit the context of the niche. Even if you are a seller, you can still be part of the program as long as you disclose the name of your own shop or others that are closely related to yours. 2 – Create a Website or a Blog – If you haven’t set up a website yet, I highly recommend using self-hosted WordPress because it’s easy to customize and scale for online traffic. There are a variety of free and paid theme designs at your disposal and many professionals can lend you technical support when needed. Here’s your chance to build one for free. Simply enter a domain you desire, follow the instruction and launch your site in less than a minute. After familiarizing with the back office of WordPress, consider converting it to a personal site by purchasing a custom domain (within the range of $15 per year) and a private hosting (cost about $30 to $40 per month). If you are planning to grow that particular niche into a long term affiliate business, the investment is going to be worthwhile. Once that is all set and done, the next step is to beef up the site with some content. 3 – Create Targeted Content – I know handmade crafts and writing sounds like a mismatch, but hear me out. You see, the internet we are using today is all about producing up-to-date information for the users. Valuable content is known to have a long life-span in the eyes of Google and hence, awarded with higher search rankings. It’s what keep visitors coming back for more. That’s why even a marketplace like Etsy publishes blogs regularly to keep their site ‘busy’. Likewise, in affiliate marketing, you are expected to do the same thing. Sharing your links in the form of content (textual and media) is recommended while using them directly on social media, forums or advertising networks are strongly discouraged as it tends to create a spamming environment. So, what type of content should you write in regards to promoting Etsy’s products? The option is plenty and it’s best to approach these topics by finding keywords that people are already using for their search queries. It’s called auto-suggest and you can discover them by entering a sequence of related words on Google. If you are already seller, you can show people how to sell their crafts online through an Etsy Store. Are you in the business of creating handmade items? Show others how they can make something using the supplies purchased from Etsy. Are constantly searching for new product ideas to feature? Create a list of ‘Top 10’ or ‘Best of..’ article for your readers. Just bought something from Etsy? Write a product review about the item, elaborating the pros and cons of the item from your personal point of view. From there, you can refine the key phrases based on their level of competitiveness. Writing a topic that is least competitive yet popular, can potentially boost your content ranking and publishing this content regularly can help Google to understand what your site is all about. The Jaaxy keyword tool is a simple-to-use program and it’s highly efficient at showing the competition metric used for organic ranking. Just enter a key phrase down below and give it a test run yourself. Now that you know the basic requirements, how can you join? First, you’d need to create an account with AWIN which is an affiliate network that manages the Etsy affiliate program. A $5 registration fee is required during the application process, but this gets reimbursed when you earn your commissions. Unaware to most people, Etsy actually has programs in several countries, so if yours is in the list below, you should apply through them on AWIN. When searching for a good program to join, it’s important to use the AWIN index score as a rough guide. For example, Etsy US currently has a score of 72% and that is considered a fairly good performing merchant. The approval rate for most of their country programs are more than 95% so there’s a high chance of getting in as long as you meet the requirements. Once accepted, you can start using the preexisting product feed or create your own to form customized affiliate links, to be used on your site. If Etsy already has so many things under one roof, why should you look beyond this marketplace for product recommendation? Well, the first reason is because you are not allowed to be Etsy-centric and the other one is to provide varieties for your audience. This allows people to choose (rather than being pushed) where they wish to buy from based on price range and outlet preferences. The other added advantage is that you can also earn commissions from other online marketplaces. Seeing that there are so many types of products within a certain niche, why not make the best out of it, right? 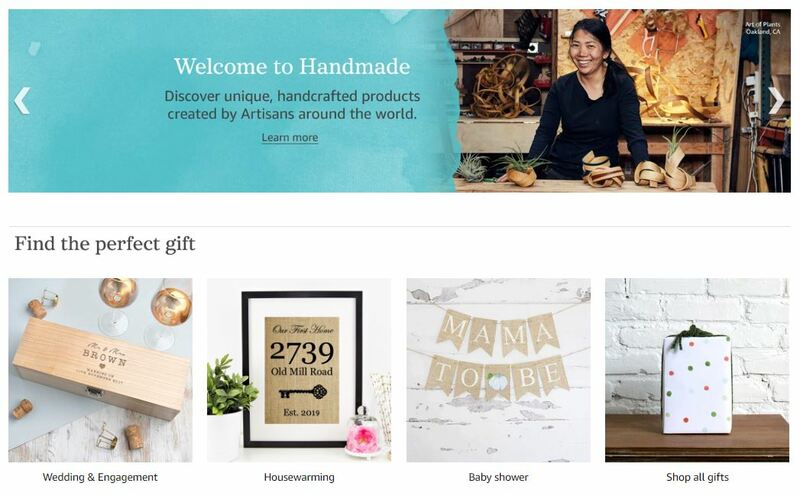 On October 2015, Amazon created a new department called ‘Handmade’ allowing artist to sell their goods through the marketplace. The best part is, this product category is commissionable at 5%. That’s 1% more than Etsy’s standard publisher rate with a larger audience to boot. That means, visitors would often buy other items to put in the same order. And if they have done so following your link, you’d earn additional commissions from other departments too. To get started, you just need to sign up through the Amazon Associate program, get the verification and you’re good to go. Zazzle is something like Etsy, except that it’s catered more for designers and makers to create customized everyday items. Customers just need to mix and match what product combination they want to order while Zazzle supplies the merchandise and the professionals provide the design template. It’s a fun site to use, especially when one is searching for a particular theme as a gift. Their referral program offers between 15% to 17% per sale with a cookie duration of 45 days and pays via PayPal or check. The links can be obtained by signing up as a user on the marketplace or through the ShareASale affiliate network. Another marketplace that has been around for a while is Joann, an outlet that supplies fabric and craft products while inspiring people with project ideas and classes. The company has more than 800 stores all over the US and their online store has a ton of stuff you could find from jewelry making to home decoration. Their affiliate program is managed by Rakuten Linkshare, offering just a mere 1% commission rate per sale. Not a lot if compared to other retailers, but nevertheless, still an option. The Bonanza marketplace is another outlet that offers many products similar to Etsy and also some branded goods in between. They don’t have as much traffic as the others, but their affiliate program offers a 6% commission rate with a 3 day cookie. You can find out more details about them through the AWIN network. The Cratejoy marketplace is one of its kind because it offers subscription boxes in a variety of niches. Customers get something new each month, so it’s almost the same as discovering something unique, be it a gift or a common product. There’s a huge trend for this type of online shopping so be sure to check them out. Their affiliate program pays 10% tiered commission and you can join via Impact Radius. Everyone should know about the Wayfair marketplace – it’s a leading online outlet for home furnishing ideas, something that would compliment very well with some of Etsy’s products. They sell mostly online and it’s the top 100 performing merchants on the ShareASale network. Their program comes with 30 days cookie and pays 7% per sale. There are many creative products nowadays, waiting to be explored and featured to a new audience. Even though Etsy may seem like the pioneer here, they are certainly not the only one. Therefore it’s good to know the ins and outs of their affiliate program and also that of others to help you can make better product recommendation as an affiliate marketer. I hope this quick overview has benefited you one way or another. If you like to learn more about growing a successful online business, feel free to look around my recommended training platform or let me know your burning questions or thoughts in the comment space below. I’ve been looking into various ways to make money online with unique items so reading this review about Etsy affiliate program is timely. Just one question, can I become an Amazon associate while still promoting Etsy’s products? Thanks. Of course you can, Alex. I’ve seen many bloggers do that with their niche. Most of the time, they started of as an Amazon associate and then apply for more programs when they want to review more products. This is a brilliant article. I love buying handmade items from Etsy and never considered it as an affiliate program. I could see a lot of potential here since handmade items are very unique and the marker is astronomical. I also never heard of Amazon handmade. That is a program I will have to take a closer look at. Would you say, focusing on selling affiliate products from Etsy or one of these other sites is less competitive than just focusing on Amazon? Most definitely Eric. The general Amazon marketplace has a lot of mass produced items and they don’t really stand out in a unique way except for competitive pricing. If you can take something from Amazon handmade and compare to those on Etsy, I think you can capture more audience attention and still leverage from both sides of the markets. I’ve heard of Etsy and it’s something my girlfriend has thought about doing because she is super into arts and crafts. I didn’t however know that they had an affiliate program! That’s awesome and something I’m going to give some serious thought into because as an affiliate marketer, I could see a lot of sales potential in the Etsy’s marketplace moving forward. Thanks for sharing this. I had no idea that Etsy had a program. I’d been looking for additional ways to monetize my cat blog and Etsy has a ton of pet related handmade products – so this is a great option. The cookie window is a heck of a lot better than Amazon, but I am surprised to see the payout structure is a little bit lower than Amazon (Amazon is a bit high right now for pet products at 8%). Either way, this looks like a great option to promote items that aren’t otherwise available on regular marketplaces. Especially with the huge trend right now leaning towards buying from small and home run businesses.